Agra* is a heavy euro game for two-to-four players that takes a good two/three hours (or more with a slower and/or larger group) to play. It’s listed as 12+ for age range, but this is pretty generous: you’ll need a bright kid with strong concentration levels to keep up with this one. The game is gorgeous (art by Michael Menzel) in a traditional euro game way, with its sized box being packed to the gunnels with bits: a huge game board and extra side board, 24 cards, 150+ wooden pieces, 100+ cardboard pieces, four player boards, four cloth bags and one lonely dice. Hard to believe I’m saying it, but in tonnage alone it’s probably worth its £60 price tag. The theme (which is pasted on in glorious euro fashion) sees you cultivating your little piece of India to meet the desires of rich aristocrats, and ultimately the whims of birthday boy Akbar the Great. What this means in real terms is an awful lot of action selection with which you’ll turn lots of stuff into better stuff to fulfil orders in a solidly euro fashion – but with a hell of a lot of bells and whistles added for good measure. If that sounds like your bag, read on. 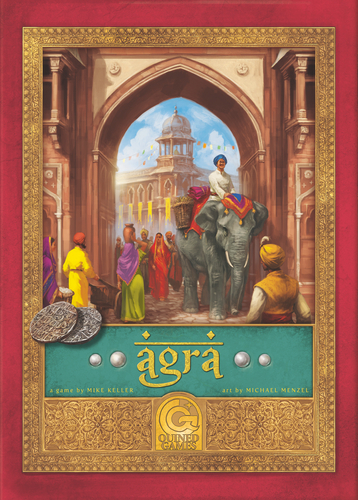 I’m not going to go deep into the rules of Agra here, as summing up a 28-page rulebook in a few pithy paragraphs would be ridiculous (it is rated 4.33/5 on complexity at board Game Geek). This is just a light overview to give you an idea of the mechanisms on display. The largest area of the huge game board displays where you can make – then evolve – the four ‘basic’ goods of the game: sandstone, wood, turmeric and cotton. Each of these can be upgraded through two levels of ‘processed’ goods, right up to being ‘luxury’ goods – but the orders you need to fulfil to gain points may require any combination of these (so one order may require, for example, a sandstone (basic) and clothes (luxury). 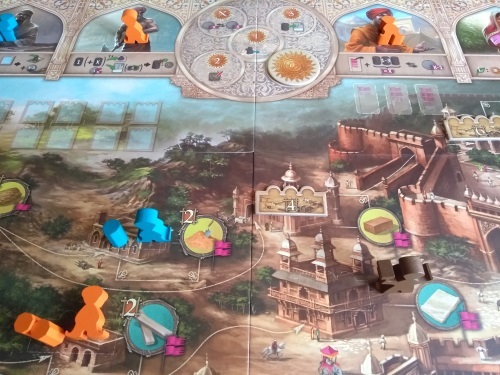 Most of the rest of the main board shows the River Ganges, which is lined with notables – while a separate ‘imperial’ board shows Akbar himself, alongside a number of guild tracks. Akbar, the guilds and the notables all have orders to fulfil (needing 1-3 different goods), each of which will reward you with either ongoing bonuses or victory points. 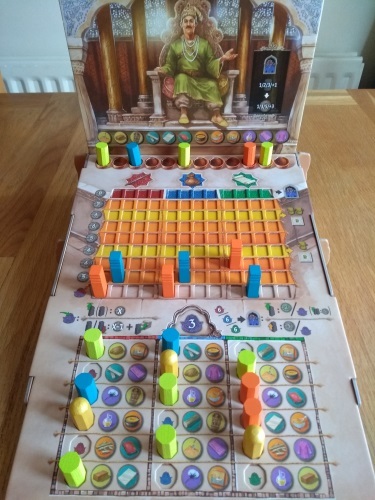 The final section of the main board contains five additional action spaces (each of the 16 goods is an action space too), while each player also has their own board which has a few more action spaces for good measure. It also shows how good you are at collecting each of the basic resources: something that can be manipulated as the game goes on and your priorities change. A player’s turn sounds simple: you have an optional ‘meditation’ phase (here you do a bonus action, if able), an action phase (where you do, you guessed it, a standard action) and the order phase – where you deliver what you’ve been making – plus there are three types of additional action you can do once each on your turn, at any time, if you are able (by the end of the game you can do a lot of actions in a single turn). That’s it. So far, so standard euro. What makes the game stand out is how many ways there are to do the same things – and it is working out how to do them most efficiently (and so turning the most points/profit) that will sort the winner from the losers. 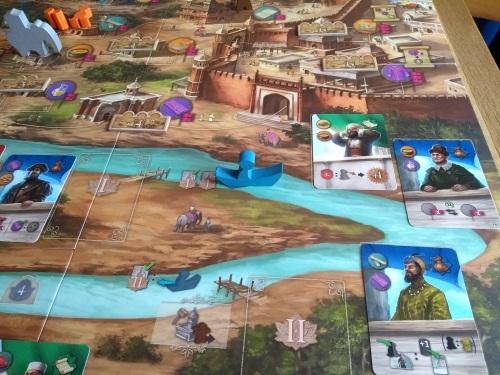 Once a player has reached the end of a guild influence track, fulfilled all of a guild’s orders, or picked up a notable from the last section of the Ganges, the game is over. These are me, plus three fictitious players drawn from observing my friends and their respective quirks and play styles. The writer: Unfortunately, the scope of Agra thematically doesn’t live up to the level of effort required to do anything. Having lots of ways to do essentially the same thing isn’t much fun, when in fact they’re all leading towards the same end. Rather than being a point salad, this is more a mechanism salad leading to a largely simple scoring system. There are several clever ideas on display, but one of the first (and most repeated) things I’ve been told about game design is that introducing one new concept per game is enough – you don’t want to overload the players with new concepts. That has not been adhered to here and I was left wondering why it hadn’t been more streamlined. The thinker: I really admire what Michael Keller has achieved here: a deeply complex web of actions and sub-actions that still forces players to compete over a shared set of specific rewards. You’re rewarded for engine building (via extra actions for being able to make luxury goods), but also for being astute in terms of the current game state. However, this makes every turn deeply thoughtful – which gets ‘worse’ as the game goes on; with the additional caveat that every player’s turn will again change the board state, so forward planning is of limited benefit. Two hours? No chance. You will need a couple of dedicated heavy gamers with a good afternoon free to get this to the table. But it’s worth it. The trasher: While this isn’t a confrontational game, it is a very tactical as well as strategic one. When a player converts a good to an improved version as their action, there is a window for anyone else with the same good to get a free upgrade too – so predicting your opponents’ moves can be crucial to success. Also, you need to anticipate what they’re trying to achieve: orders have very specific requirements, so if you get gazumped on the way to completing something it can put your plans back in a hugely frustrating way. You can’t just sit back and do your own thing – you have to pay attention to what everyone else is doing. But do you care enough to think that hard about it? I know I didn’t. The dabbler: The game is beautiful. The board looks amazing, the raised side board looks great and the oversized pieces really pop on the table. But just, no. I started to lose the will to live in an early rules explanation and haven’t looked back. Definitely, definitely not for me. Pretty simply isn’t enough this time! A big problem Agra has, whether you like the game or not, is style over substance. While beautiful, the main board is a mess of detail – making a game that already has a high level of entry even worse. In addition, some of the wooden pieces are too big, the cardboard ones too small, and the Akbar board an angled accident waiting to happen. The rulebook doesn’t help either. The layout isn’t conducive to finding the many small details you’ll find yourself having to reference as the game goes on; and many edge cases that could’ve been covered in pictorial examples have been overlooked. Which brings us on to iconography, which is unfortunately not the best. If you weren’t already dipping in and out of the rulebook for rule clarifications, you will be for icon ones. The mass of choices available right off the bat get in the way of learning the basics, making this is a game purely for heavy gamers. And it feels wilful – almost as if this has been deliberately made to be impossible to access unless you’re part of the ‘heavy club’: it’s like the gaming equivalent of free form jazz. 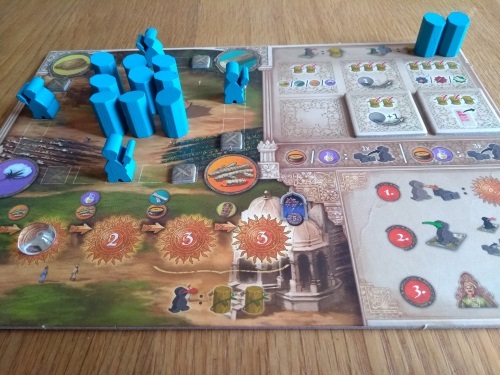 This isn’t a game that tries to avoid ‘analysis paralysis’ – if you don’t get AP playing Agra, you’re not doing it right. But, despite all that, this is a very highly rated game. It appeals to its crowd, pressing the right buttons for a certain type of heavy gamer – so why shouldn’t Agra (and Quined Games) be applauded for that? Every niche needs its champion and with more than 500 8+ rating on Board Game Geek, this game has found its niche and then some. Agra was a miss for me – and that’s a shame, which feels like an opportunity missed. I’d love to see a lighter version of the game that keeps many if its cleverer elements but gets rid of the wilfully complex. I can’t help thinking there is a glorious one-hour euro hidden in here, where the tactical challenge isn’t so hampered by an overly diffuse set of mechanisms and sub-mechanisms. But as already mentioned, there is a heavy gamer crowd out there that needs new games – where, on the other hand, does the world really need another one-hour euro game? Hopefully a designer will take a few of the great concepts hidden in here and apply them to something more up my street in future: but until then, I’ll leave this one for my heavier brethren. * Thanks to Quined Games for providing a reduced-price copy of the game for review. This entry was posted in Board games, Games by Chris Marling. Bookmark the permalink.